We always need to challenge racist, single issue, self-serving corporate politics in social justice movements. 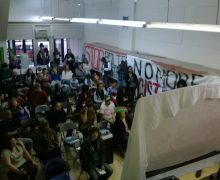 The Institute for Critical Animal Studies (ICAS) prides itself on being intersectional, grounded in anarchism, and focused on total liberation, and we promote these three concepts in the animal liberation movement. ICAS recently came across Mercy for Animal’s (MFA) highly problematic blog post about former San Francisco 49ers’s quarterback Colin Kaepernick, who happens to be vegan. To be clear, we think it’s awesome that Kaepernick is vegan. The problem is that before MFA and others within the animal rights nonprofit industrial complex found out he is vegan, they were silent in supporting him in his position against racism and police brutality in the U.S.
His protests began in 2016 when he kneeled during the American national anthem and continued to do so despite the adversities that followed. His knee-taking caught on globally; it was commented upon by politicians and mirrored by other athletes and fans. However, Kaepernick was not taking a knee for animal liberation and veganism—his protest was/is against racism and police brutality against People of Color (POC). His historic rise to recognition did not come about because he is vegan, but because he is fighting for racial justice through an avenue that isn’t opened to most: the multi-billion dollar National Football League that garners millions of weekly viewers. 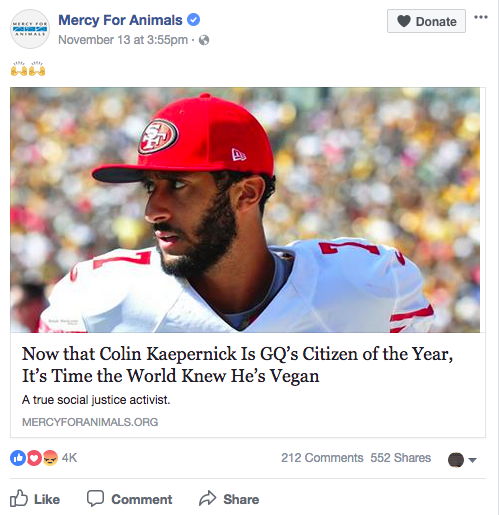 MFA’s article title “Now That Colin Kaepernick is GQ’s Citizen of the Year, It’s Time the World Knew He’s Vegan” seems to suggest they were following his one-man campaign all along, fighting with him on the sidelines, and awaiting GQ’s announcement so that they could tell the world he’s vegan. This causes us to raise these questions: Where was MFA before they knew Kaepernick is vegan? Would the racism he’s fighting make it onto MFA’s wheelhouse if he wasn’t? Why don’t non-vegan activists merit MFA’s attention if they really care about America’s violent police state? MFA does not write about Mike Brown, Eric Garner, Oscar Grant, Trayvon Martin, or Tamir Rice, just some of the youths and men whose deaths triggered international calls for accountability, the Black Lives Matter movement, and Kaepernick’s activism. The reasoning is simple but troublesome. 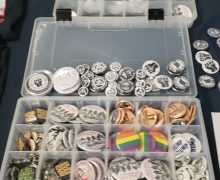 MFA is not concerned with anything other than animal rights, and this would not even be worth noting if they didn’t filch from other movements when it meets their needs, as is done whenever Holocaust, Native American genocide, and slavery are used uncritically to draw attention to the suffering of non-human animals. This behavior is racist. It is metaphorically lynching, choking out, and stepping on the necks of Black people by using them as props for the betterment of veganism and nonhuman animals. So, what is ICAS asking for? Simply, we request the same thing as the Colin Kaepernick Foundation, as cited by MFA: “fight oppression of all kinds globally, through education and social activism.” For ICAS, this means expanding one’s view of social justice to include humans, and if you cannot authentically do so, don’t dip into the world of racial justice as a means to a different agenda’s end. MFA and other nonprofits need to learn how to explain animal oppression better than just making elementary, problematic, self-serving analogies. 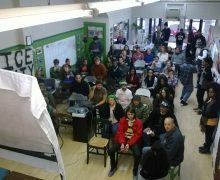 We sincerely believe that groups can move forward in their goals if they are earnest in their convictions and make efforts to work with other movements instead of flailing around looking for the next Person of Color to hold up as a vegan trophy. We’re not holding our breath, and you shouldn’t either. Don’t wait for MFA to do the right thing. You don’t need them. Get on social media, visit pertinent websites and listservs, and hit the streets demanding the end of racism and police brutality toward POC. However, if you are not a POC, please do not take that final step unless you are working on your own racism. And to anyone who responds to this by saying, “I’m not racist,” you are the one with the most work to do. That includes you, MFA.